TOFU MOM . . . and gravy! 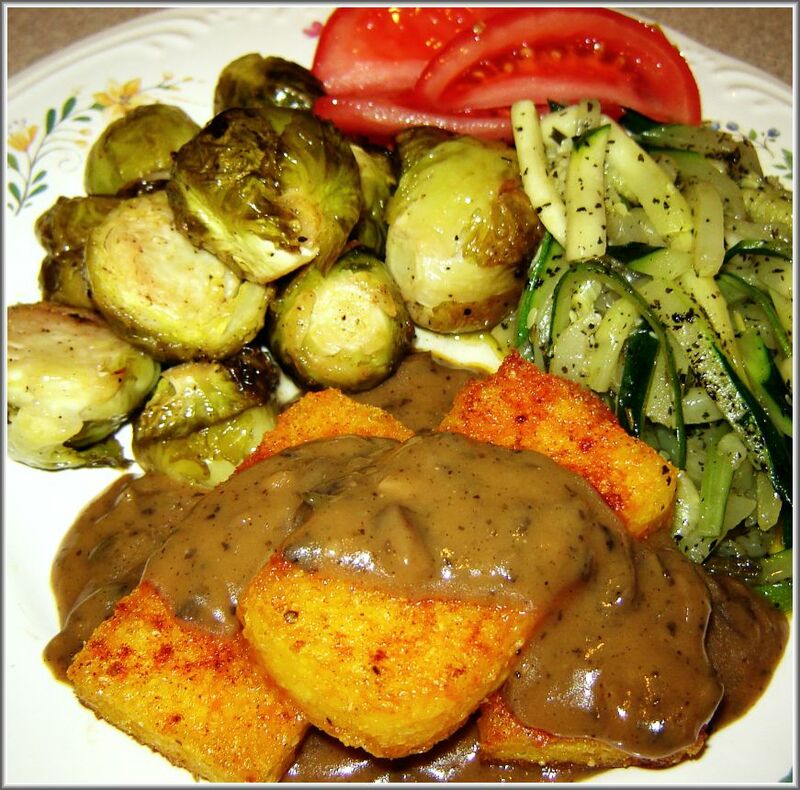 : Cookbook Review; And A Give-Away; And Gravy. Cookbook Review; And A Give-Away; And Gravy. I wanted to take a quick break from recipes and gravy to post a review on a very special cookbook. For my Birthday last month, I treated myself to a couple Amazon.com purchases. 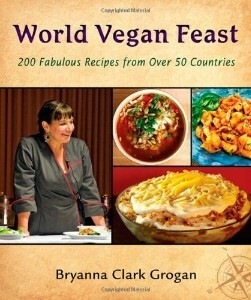 My favorite purchase, by far, was World Vegan Feast: 200 Fabulous Recipes from Over 50 Countries by the lovely (and expert) vegan cook Bryanna Clark Grogan. Bryanna has written 8 (I think?) fabulous vegan cookbooks, (sadly I only own seven) each of which is packed with all sorts of wonderful foolproof recipes, details and cooking tips. Seriously though, World Vegan Feast is (in my highly professional, totally unbiased Tofu-Mom opinion) Bryanna's best, and my favorite, so far! The book has over 200 really informative, well-written, unique and super-tasty recipes from around the world. As a history-geek-foodie sort myself, I especially love the extensive food science and history knowledge, and the obviously thorough research Bryanna has put in this book. So far, I've been blazing my way through this cookbook because SO MANY of the recipes sound so good! In fact, I've tried more recipes from this cookbook in the past month than I've made out of many cookbooks I've owned for years; Jamaican-style Pumpkin Rice, Smoky Baked Tofu, Pesto Hollandaise, Mashed Potatoes with Chard and Garlic, Guacamole, Italian Chocolate Hazelnut Spread, Späetzle and Polenta - and I think a couple more. Just look at my completely delicious little squares of perfect, crunchy-creamy, golden polenta!! I had no idea it was so easy! Ignore the other weird-colored food, the flash makes the veggies look anemic. 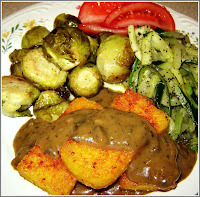 (And of COURSE, I had to top it with gravy.You knew I'd do that. So, that wasn't from the book, that was my idea.) Anyway, I thought about writing a mouth-watering review and description of each recipe I've made, but realized that would take up a lot of room and I might possibly run out of creative adjectives for delicious, fabulous and super-yummy! Yes, each recipe was perfectly wonderful and the directions were very clear and helpful, making them virtually fool-proof. And best of all? Well, the whole book is fun! Lots of unique and interesting recipes you may have never heard of or those you HAVE; vegan versions of your Grandma's old German (Creole/Spanish/French/Hungarian/Chinese/whatever) recipes and those foods you always wanted to try but they weren't vegan. Anyway, while not all the recipes are super-basic-beginner-easy, the instructions and directions are!! They're thorough and carefully detailed so it's like Bryanna's hanging out in the kitchen with you and helping you, step by step. I think anyone of any cooking ability will feel confident tackling them. DO NOT miss a chance to check out this cookbook. It's a great compliment to any collection of cookbooks, large or small, vegan or not. and I am positive you'll find a dozen recipes you MUST try immediately! That said, I'm so infatuated with this cookbook, I want one of my lucky readers to start cooking like a culinary world traveler too, so I'm GIVING AWAY A COPY OF WORLD VEGAN FEAST! THE WINNER (after a random drawing) IS "LITTLE RED HEN" I'll contact you about shipping. CONGRATS! Open to U.S. residents only, leave a comment here telling me what "world recipes" or "family favorites" you've always wanted to find vegan versions of. For an additional entry, follow me (Tofu_Mom) or Bryanna (VeganFeaster) on Twitter and Tweet about this giveaway, then post another reply here saying you did so. I'll pick a winner on Monday about 8PM. Oh, that book looks so great! I'm especially excited about the späetzle recipe, that's a food I've been wanting to veganize forever! This book sound amazing! While I am not vegan, I do have family members that are, and my hubby and I do try to eat at least two vegan meals a week, if not more. I have been wanting to find some veganized versions of many German foods, like spaetzle, schnitzel and the larger dumplings like my grandpa used to make. I'd also like to find some vegan versions of pierogi or nalysnyky and a few other Ukrainian foods as my husband is part Ukrainian. That Jamaican-style Pumpkin Rice sounds amazing! I'd also like to find a way to make tofu that would interest my husband, and that Smoky Baked Tofu just might be the winner. Thanks for your consideration and good luck to all! I also followed you and retweeted about the giveaway on twitter. Lovely giveaway! I'm very interested in figuring out how to veganize Egyptian kofta. This cookbook sounds amazing - I would really like to learn how to make SE Asian food without all the fish sauce and shrimp paste that is in the non-vegan recipes. Also, making vegan pierogies was one of my new year's resolutions. I only have 2 months left! I have always wanted a vegan version of angel food cake. But I think that is pretty much a pipe dream, lol. I also followed on your blog. Following you on Twitter, and tweeted the giveaway. I've always wanted to make a great vegan Caribbean-style roti. Yes please! I was happy to find a vegan sausage ball recipe this mofo. An old family reunion favorite. I follow you on twitter and just tweeted about this. This is kind of hard, but I would love my mother's Japanese Yakitori made vegan. How this can be accomplished, I don't know! I really dislike the texture of seitan, tempeh etc. when not shredded. I love Bryanna's recipes! I'd love to make vegan versions of german food. My cousin's wife is Austrian, and I'd love to be able to cook something for her! I would LOVE to win that book--I have been lusting after it since it came out and my library doesn't have any copies. Your review makes me want it even more, lol. Since I am not on Twitter, I will have to hope my entry is extra lucky! I would like to veganize my grandma's cinnamon bread. Sure, there are lots of vegan cinnamon roll recipes, but her cinnamon bread was just amazing...I have yet to find anything that comes close! I really love anything Indian, Thai, or Spanish. I would also love to learn about cuisines I am not familiar with. Any kind of schnitzel! Being of Hungarian/Austrian descent my family loves their meat. If I could make a decent one I would definately win my sister all the way over to the vegan side! I'm not vegan, but have friends who are, and I would love to cook that way more. You make this book sound SO appealing!! I'm not sure what recipe I would most want to make vegan! And I'm now following you on Twitter! Nice to see you're from the same general area (Puget Sound) as we are! I've heard so many wonderful things about this book! That you say it's your favorite of all of Bryanna's books is really saying something! Lately, I've been wanting to make vegan soft egg(less) noodles. I've never made homemade noodles before, but it would be fun to try. I've always hoped for a vegan version of the Swiss dish, raclette. 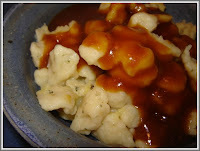 I would love to know how to make bavarian bread dumplings. Tried tomake them vegan & it ended up soggy, so I baked them on the oven like stuffing. Tasted good, but definitely not the end result I was looking for. Meatloaf jumps to mind, but I'm also still searching for the perfect pierogie recipe! I would like to make a vegan version of pho. My favorite food growing up was my mom's meatloaf. I remember that my friend hated meatloaf, and I told her about my mom's and how amazing it was. Somehow after that, her mom got my mom's recipe and my meatloaf-hating friend loooved it. Would I find it yummy now? Who knows. But a vegan version could be nice for nostalgic purposes. A vegan version of ramen! I've always wanted to find a vegan version of this dish called Chicken Burri-Burri from Africa. I had it at a world festival in Seattle years ago and it blew my mind. I've recently enjoyed Ethiopian cuisine and would love to see more recipes that use their complex flavors. I love Bryanna's recipes and have been wanting to add this book to my collection. I would like to find a good vegan version of gyros. I am entrigued by your description of the polenta. I had it at a restuarant whilst traveling that was a yummy creamy dream and have been looking for the how-to ever since, I am like a polenta recipe stalker...lol. Perhaps this is the charm! I would love to find an EASY and QUICK recipe for pierogies! I think I have five of Bryanna's books so I'm lagging behind you! I would love a vegan recipe for arancini - they are lovely little Arborio rice balls. I followed you on Twitter and tweeted about this excellent giveaway! My husband's family is Hungarian, and his grandmother used to make Hungarian walnut cookies that had gobs and gobs of sour cream and lot of egg whites. They are my husband and his siblings favorite cookies ever! Pupusas! I really want to see those veganized soon.